The tuber of N. 'Albert Greenberg' at the left is very unusual in that is has over 40 new plants growing from it! Tuber and photo by Sean Stevens. The entire tuber can be planted or new plants can be "pinched" from the tuber and potted separately. We use 8 ounce Solo cups for these little plants, placing half a PondTabb in the bottom of the cup. It is also a way to use up PondTabb "crumbs" that have resulted from getting the Tabbs damp. We fill the cups with dampened "yard dirt" (any type of soil will do except those containing light material) and dig or poke a hole in the center for the plant's roots. We stuff in the roots, fill around them and situate the little crown (central growing point) exactly at soil level. We then anchor the plant with a pin made from orchid wire to prevent the plant from floating out. Tip! We label all our plants with orchid tags and write on them with plain #2 pencil. Even under water, these tags are readable for years. We write on both ends (above and below the soil line) to be doubly sure. We use several methods for growing new plants from tubers, combinations of ideas shared with us by many including Rich Sacher, Stan Skinger, Betsy Sakata, Craig Presnell and John Baron. Simply putting the tubers from storage in soil and hoping they sprout is both labor and space intensive so we also suggest these alternatives. Some of these are the same methods that can be used at the end of the season to get plants to make tubers for storage. As the water cools off in all but warm climates like ours, most tropicals will go dormant and produce tubers as they do so. Sometimes they must also be "cramped and starved" to produce tubers, keeping pot size very small and withholding fertilizer. Because our growth can be rampant even "cramping and starving" and our water never gets very cold, we have a difficult time getting some plants to tuber. The bucket and tub methods described below seem to work the best. CHAIN PRODUCTION is the most tested method for growing multiple plants. Tubers are placed in very small pots of soil. When new plants have floating leaves about the size of a quarter, they are pinched from the tuber and repotted, the tuber left to make another plant. This can also be done in reverse, leaving the plant and repotting the tuber. FLOATING BAGGIES: Tubers are placed in zipper bags filled with water and floated in a warm pond. Because we start quite a few we arrange them all in a dish pan which floats around the pond. We mark each bag with the name but also place a tag in the bag in case the outer name wears off. Tubers in bags are jump-started by the heat build-up. As long as the plants are attached to the tubers they don't seem to "cook" but will deteriorate rapidly when separated from the tubers and left in the bags. Plants can be pinched and potted as needed. TUBS: Dish pans or other containers can be filled with an inch or two of gravel or lava rock and then with water. Tubers are buried in the gravel and produce new plants, their size limited by a total lack of nutrients. If these plants are removed from their tubers and left in the gravel, they often will make new tubers as the weather cools. BUCKETS: Tubers can be placed in open buckets of water and will often sprout. In reverse, plants can be placed in the buckets, allowed to cool off, and will sometimes make new tubers. FROM SEAN STEVENS, Vancouver, BC, Canada: "When I pot a tropical tuber, in order to get new starts rooted, I place the tuber horizontally just on top of the growing medium. This way the new growth will root into the medium away from the tuber rather than grow over the tuber. This prevents root damage when the tuber is pinched from the plant and prevents the need to wash away the soil. "If I'm not potting the newly pinched "starts" from the tuber, I float them on the surface of well seasoned pond water or a container with pond water where the water temp remains above 75F. Within one week a pea-sized tuber will have formed. In three weeks it can be the size of an oak acorn to a walnut size. At this point I will pot up the whole plant, tuber attached and allow it to grow on for the rest of the season. The new tuber will harden off, grow a bit more and be ready for further propagation or dormant storage later. 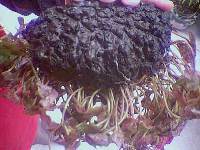 This method works best for me and I have found every plant will begin tuber formation this way. Water temps can not be below 70F (and rarely goes above 86F) for this to work and new water seems to hamper tuber growth as well." STORAGE: Never think that a pot that has contained a tropical lily is empty! Before discarding it, sift through the soil for tubers. The best method for storing them is in moist sand in sealed containers. They should not dry out totally but shouldn't be "swimming" either. Storage temperatures can be from 50F to 90F without damage with 60-65F ideal. to store them too wet and exactly what is moist enough is hard to judge. When I think I have the sand to the right consistency, I push down on the mixture with my thumb. I want the sand moist enough to hold the indentation, but not so wet that the compression squeezes out any visible moisture."